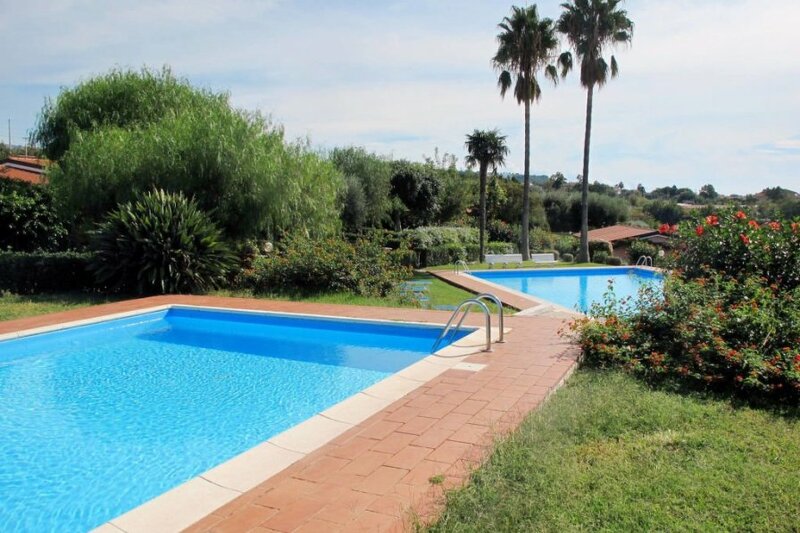 This 2 bedroom apartment with swimming pool is located in Contura and sleeps 6 people. It has WiFi, air conditioning and barbeque facilities. The apartment is within walking distance of a beach. Terraced house, 4 - 6 people, 3 room/s, 2 bedroom/s, 2 bathroom/s, approximately 60 m², 1 floor/s, renovated 2018. Permanent tenants and holiday makers live in separate semi-detached house. Feature: Property in a residence (max 1 floor(s), 6 building(s) in total, 30 units in total). € 10 per person and stay (depending on occupancy). Holiday resort tax. Linen/towels available. Change of bed linen/towels, € 8 per person. Deposit € 250 (in cash). Cot/​High chair free of charge (on order). Pet 1 pet allowed (please advise prior to arrival; additional animals on request only). Estate (shared use with holiday guests): approximately 2 ha, closed plot (fence, electric entrance gate), in a hillside, terraced, trees, meadow. Garden maintenance by the caretaker. Outdoor facilities(shared use): brick barbecue, barbecue area. Pool (shared use): 12.0 x 6.0 m, 11/05/19-05/10/19, open from 7:00-AM-8:00-PM h, pool maintenance by the caretaker 7 time(s) per week. Pool area: tiled, lawn for sunbathing, sun loungers, external shower. Pool 2 (shared use): 8.0 x 4.0 m, 1.50 m deep, 11/05/19-05/10/19, open from 7:00-AM-8:00-PM h, pool maintenance by the caretaker 7 time(s) per week. Sports facilities/ leisure time: shared use (free of charge): tennis (depending on availability). Important information: 1 reserved parking on the beach for each terraced house. Plot description: private part of the estate approximately 40 m², open plot, trees, meadow. 1 x parking in the holiday complex; parking outside the holiday complex. Terrace (roofed), reserved open space (under trees), furnishing provided, 2 deck chairs, 2 sun loungers. The agent describes this apartment as a family friendly holiday rental ideal for the summer holidays. It is also good value for money. This apartment is located in Contura. The nearest airport is 55km away. It is set in a convenient location, just 0 metres away from a beach and 8km away from the city center. The apartment has free wireless internet. The apartment is adequately equipped: it has air conditioning and a dishwasher. It also has a BBQ and a tennis court.